See each caterpillar’s transition as it matures, changes into a chrysalis, and finally emerges as a Painted Lady butterfly Insectlore! 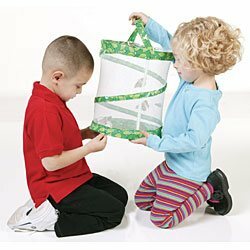 Butterfly Garden Kit By Insectlore. After observing your butterflies growth from caterpillars in the Butterfly Garden you can experience the joy of releasing them into your backyard! This Butterfly Garden Includes colorful habitat, a certificate for 5 butterfly larvae with special food, and complete instructions. 010100 Insect lore butterfly Garden Grow your own butterflies.